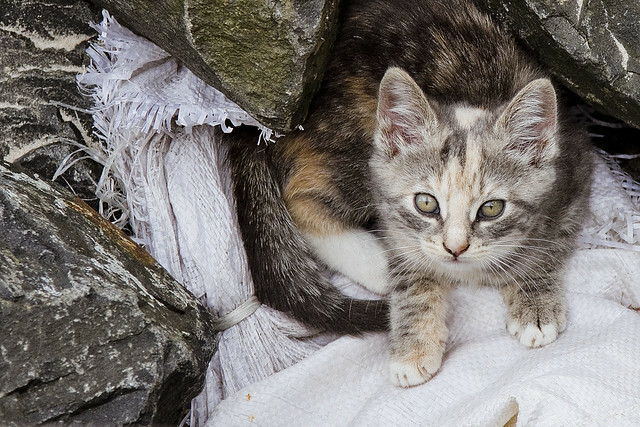 This kitten was observed living in the rip rap shoreline of Staten Island a while back. Other members of the family were present, and based on the threatening “ruhhhrrrrrrrr” sound emanating from a hidden spot in the rock pile, one of them was its mom. A humble narrator is hurting for content at the moment, and will be out wandering all afternoon seeking pleasurable scenes and interesting things to photograph. Wish me luck. Why don’t you head into the area north of Broadway and east of 49th Street? Unexplored territory if you ask me. georgetheatheist . . . 2 cents. funnily enough, that’s where I was wandering around today. problem is that it’s largely residential, and I don’t like taking pictures of people’s houses.